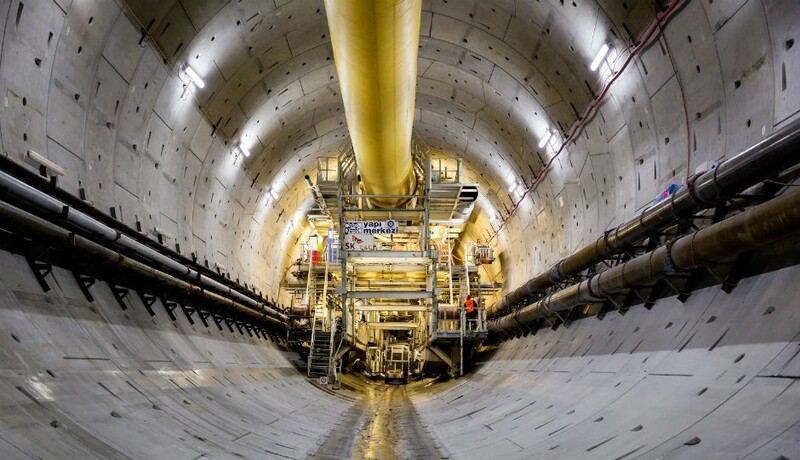 The technically extremely complex challenges make the construction of the 3.34-kilometre-long tube for the Eurasia Tunnel one of the world’s most demanding tunnelling projects. Making the job more difficult for both tunnellers and the tunnel machine is the combination of challenges. Many tunnels face high water pressure, though not quite so high as this, and many tunnels face blocky, fractured, abrasive and difficult rock. Several have to go through soft ground and some have to make a transition between hard and soft. Some tunnels have very big diameters. For the Bosphorus all these factors came together at once. On top of that, there was also a high seismic risk from the major Marmara fault line just to the south of Istanbul. Special yielding joint technology was applied at two critical points, with the joint segments made and tested in Japan. The tunnel runs across the narrow Bosphorus seaway connecting the Black Sea to the small Sea of Marmara and the Mediterranean beyond it. The sea channel famously separates not just two sides of the city but two continents, Europe and Asia. The new route sits at the south-east end of the Bosphorus, on the populous urban coast of the Marmara sea, running between the historic Golden Horn peninsula on the west with its Blue Mosque and Hagia Sophia, and the port districts on the Asian side. There has been no direct connection between these important areas. Currently ferries link the bustling conurbation at various points and there are two major road bridges at the mid-point of the Bosphorus. But both are clogged with traffic at rush hours. Now the new tunnel section, and the overall 14.6-kilometre long highway it is part of, will cut journey times from 100 minutes to 15. The link will also relieve traffic loads on the bridges but without intruding on the famous skyline. But to do it, the alignment must go 106 metres deep under the Bosphorus. Meaning “throat” in Turkish, the channel was carved through the Trakya Formation, a complex of sandstones and mudstones, by sudden massive flows of water between the seas in geological times. In the glacial period it was partly filled with soft alluvial deposits but the water is still 62 metres deep where the tunnel crosses, with bedrock 40 metres below that. The tunnel goes through the permeable sediment and highly fractured rock, each saturated with the seawater above. The impermeable reinforced concrete segments used in the subsea tunnel have an average compressive strength of 70 megapascals and were produced by the Yapı Merkezi Prefabrication division. The TBM from Herrenknecht has a face provided with both hard rock discs cutters, mounted on six radial arms, scrapers and buckets and openings between for the slurry support and spoil removal. The chosen TBM was designed with some special features to tackle the conditions. Firstly of course it had to resist the very high pressure, up to possibly 12 bar, in itself a challenge. Then as far as possible it had to allow working conditions inside at atmospheric pressure and a key element in this was to be able to change disc cutters. The TBM has a face provided with both hard rock discs cutters, mounted on six radial arms, scrapers and buckets and openings between for the slurry support and spoil removal. The TBM was designed to resist the very high pressure, up to possibly 12 bar, in itself a challenge. “We have used a sophisticated system to allow the disk changing directly from within the cutter arms at atmospheric pressure,” says Werner Burger, head of engineering at Herrenknecht. He says the design approach was first used on a machine in Hamburg but not at this size and depth. Discs, which are 19-inch double edge types, are removed from the face along with their housing and a new cutter-housing unit is installed, the operation taking about two to three hours. Overall, approximately 500 excavation tools have been changed during the complete drive – all under atmospheric pressure from within the cutter arms. Inside the control cabin of the Herrenknecht TBM, a special monitoring system from VMT was used for the first time. It monitors the performance of the disc cutter system, measuring key values like rotation and temperature. Results are displayed on a screen where sound units are shown in green and abnormal discs show a yellow or red alert. He says that after a few teething problems the system has proved excellent and beneficial for the disc cutter performance. It works in conjunction with a wear detector pin system, which is a hollow projection alongside the disc with pressurized hydraulic fluid inside. If the disc wears too far the top of the pin is worn off and fluid released which a pressure detector picks up, again alerting the operator. From the launch shaft on the Asian side, the Eurasia Tunnel runs beneath the Bosphorus towards Europe – at a depth of up to 106 metres below sea level. Inclinations of up to 5 percent were overcome. To change the heavy disc cutters and housing units, weighing up to a tonne, the TBM is fitted with an internal railway with a carrying trolley and lifting equipment. The same rail is also used to transport a diving pressure transfer chamber in case of interventions needed into the pressure chamber behind the TBM cutting wheel. The pressure compartment fits onto a special airlock at the top of the bulkhead, lifted up by a scissor platform at the end of the rail. Divers use the chamber to return to surface and enter a decompression unit where they have to stay up to three weeks after a dive. “The TBM bulkhead is also provided with a central lock to allow access into the central bearing area,” says Burger. Both locks are part of a specification on the machine allowing for hyperbaric interventions, a feature to allow for possible maintenance or repair needs which would otherwise have been extremely difficult if not impossible. Access from outside the machine, if it had stopped, would have been impossible at 106-metre water head. Several uses have been made of an onsite diving team. Other special features on the machine include extra “chisel” grill bars across the slurry openings in the face. These allow for the heavily fractured quality of the Trakya Formation which meant blocks coming away from the face. They were kept in front of the cutting wheel until TBM action reduced their size enough to allow through the spoil grill into the jaw crusher and then slurry line to surface. The cutting wheel of the 13.66-metre-diameter TBM briefly after the breakthrough in the target shaft on the European side of the Bosphorus. The different changeable excavation tools like disc cutters and scrapers.